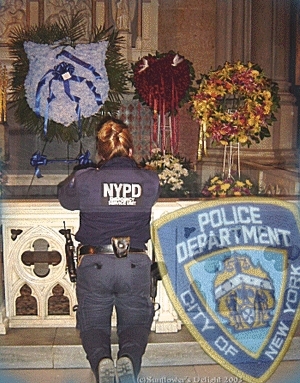 Photo taken at the Memorial Service of Police Officer Moira Ann Smith on February 14, 2002 at Saint Patrick's Cathedral in Manhattan. The memorial service was held that day because it was the anniversary of her 39th birthday and the day that her husband and she met and had their first date. Moira Smith from Bay Ridge, Brooklyn wanted to become a police officer since her friends could remember. Her dream came true and she was truly one of the finest. On 9/11 she and a fellow officer from the 13th Precinct, Robert Fazio, ran down from from the east side of Manhattan in the 20's to the WTC. They were responsible for saving many lives that day. We take this opportunity to thank their families especially Moira's small daughter Patricia for their courage and ultimate sacrifice there that day!